From Governor McAuliffe’s office: Governor Terry McAuliffe today issued Executive Order Number 67 temporarily halting issuance of permits and prohibiting demonstrations at the Lee Monument until new emergency regulations have been approved and implemented by the Virginia Department of General Services. Governor McAuliffe determined that following the events of the Unite the Right rally on August 12th in Charlottesville, and subsequent deaths of three individuals, to develop a comprehensive set of fair and consistent rules to both protect first amendment rights and prevent threats to public safety. The Governor believes that this suspension is necessary to give state and local officials breathing room to make thoughtful and informed decisions on managing the new reality of the potential for civil unrest. Governor McAuliffe will issue a related executive order convening a task force, headed by Secretary of Public Safety and Homeland Security Brian Moran to study the safety concerns that arose from the events of August 12th. The Department of General Services will craft their new emergency regulations based on the recommendations of this new task force, which will be issued within three months. The Lee Monument presents unique challenges to large-scale demonstrations because it is located on a major thoroughfare in a residential neighborhood in downtown Richmond, and current rules date back decades. Current standards, for instance, permit demonstrations containing as many as 5,000 people. In addition, the permits allow for assemblies to gather from sunrise until 11:00 P.M. As a result, these conditions provide for not only major public safety concerns, but present serious threats to both traffic and private property. Virginia is the birthplace of liberty in the United States, and the Commonwealth has had an historic commitment to freedom of speech, freedom of religion, freedom of the press, freedom of assembly, and freedom of thought are among our most cherished values. Recent events have also demonstrated that activities surrounding Confederate monuments within the Commonwealth raise substantial public safety concerns. 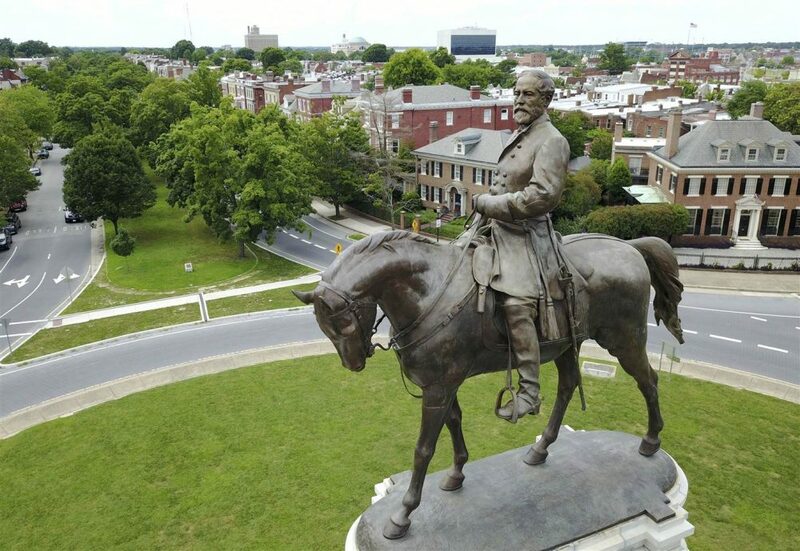 Among these are the statue of Robert E. Lee on horseback, and the surrounding grounds, located within a traffic circle on Monument Avenue in the City of Richmond, Virginia (the “Lee Monument”). On August 12, 2017, I declared a State of Emergency based on a state of civil unrest in Charlottesville, Virginia, caused by violence that erupted over a demonstration organized by the Unite the Right organization, which included a number of affiliated white supremacist and Neo-Nazi hate groups. I was compelled to order the Virginia National Guard to active service for the purposes of controlling civil unrest, an action that has not been taken in decades. The stated purpose for the Unite the Right demonstration was to protest the City of Charlottesville’s decision to remove a statue of Robert E. Lee from one of its city parks. The violence in Charlottesville, Virginia was broadcast around the world, and the protests and counter-protests ended in tragedy. Demonstrators descending on the rally became engaged in violent conflict, leading to a declaration by city officials that the rally had become an unlawful assembly. Later, a man using his car as a weapon plowed into a group of counter-protestors, injuring 19 people and killing a young woman, Heather Heyer. The chaos of the day required extraordinary sacrifices from law enforcement, including the crash of a Virginia State Police helicopter that killed Lieutenant H. Jay Cullen and Trooper-Pilot Berke M.M. Bates, who were surveilling the scene from the air. Subsequent protests have threatened not only violence against citizens, but also violence against the monuments themselves. In the days since the tragedy in Charlottesville, law enforcement in Richmond, Virginia have responded to demonstrations around the Lee Monument, including situations that involved heavily-armed protestors that disturbed the peace near the monument. In Durham, North Carolina, a recent video showed protestors tearing down a statue of a Confederate soldier, resulting in felony charges against those involved. Reviewing the events in Charlottesville to determine what steps can and should be taken to prevent any such violence from occurring again is critically necessary for public safety and demands a full review of permitting processes and other relevant regulations. There are already, and it is anticipated that there will be more, permit requests for demonstrations at the Lee Monument as the public debate over Confederate monuments continues, leaving grave risks for future civil unrest. Until a full review process has been concluded, it is a threat to public safety to allow permit-requiring activity to occur in the absence of such sensible regulations that should be implemented to govern all expressive activity at the Lee Monument, no matter its content. Additionally, regulations governing the use of the Lee Monument were last reviewed some time ago. A critical review of these regulations is long overdue. Unlike a city park, the Lee Monument serves a limited purpose and has not historically been an open forum for expressive activity. It sits in a traffic rotary, in a major thoroughfare through the City of Richmond, in the middle of one of the most scenic and historic residential areas in the United States. Current standards contemplate up to 5,000 people gathering at the Lee Monument. Given the size of the Lee Monument, the fact that traffic continually passes around it, and that there is no pedestrian crosswalk for access, I have concluded that permitting any large group would create a safety hazard in the current circumstances. Current policies also allow for permits to be issued from sunrise to 11:00 pm, which also could, given the Lee Monument’s proximity to private residences, interfere with the quiet enjoyment of those properties. Moreover, the Lee Monument is a State-property island in an area otherwise regulated by the City of Richmond, yet there is no formal requirement for coordinating approval through the City of Richmond’s permitting process. This regulatory gap, which has heretofore been handled informally, must be addressed. 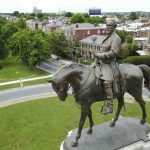 It is also clear that adequate alternative venues exist to accommodate any expressive activities that citizens may desire to conduct, should the Lee Monument be temporarily closed for permit-requiring activity. No demonstrations shall be authorized at the Lee Monument in the absence of a permit issued by the Department of General Services. The term “demonstrations” includes demonstrations, processions, picketing, speechmaking, marching, vigils, and all other like forms of conduct, that involve the communication or expression of views or grievances, engaged in by one or more persons, the conduct of which is reasonably likely to draw a crowd or onlookers. This term includes the display of flags, banners, or other demonstratives designed to communicate a message. No permits for demonstrations shall be issued for activities at the Lee Monument pending adoption of regulations by the Department of General Services to govern such activities. Under separate Order, I will convene a task force, led by the Secretary of Public Safety and Homeland Security, to evaluate the public safety issues arising from the events of August 12, 2017, including regulatory best practices related to the Lee Monument. The Department of General Services is directed to promulgate emergency regulations by November 18, 2017 to govern any public use of the Lee Monument based upon the recommendations from this task force. This Executive Order shall become effective upon its signing and shall remain in full force and effect until such emergency regulations are promulgated by the Department of General Services by November 18, 2017. Given under my hand and under the Seal of the Commonwealth of Virginia this 18th Day of August, 2017.